On the Silica Falls Trail. Iron Mixes with Clay in the Streambed. As it Oxidizes, it Turns this Brilliant Orange Color. Please excuse the quality of these pictures. I only had my phone with me this day and it was dark and rainy almost exclusively. My phone does a rotten job in these conditions. One of the reasons we picked the place we were staying was the shuttle service to and from the Tongariro Crossing. It makes things so convenient and simple. You stay in the place closest to the start of the trail, they take you there a little earlier than most other places do, and you get to hit the trail before it gets too sunny and mobbed with people. As I mentioned in the previous post, even though this is an extremely popular hike it is physically challenging. You begin by hiking up the side of a mountain with lots of loose rock (about one hour? ), the trail then levels out some for the bulk of the hike, and near the end you descend down into a forested area, but for most of the day you are out in the open getting blasted by wind and sun (or rain). This is a long hike taking between 7-9 hours. Since we live in ultra-flat Florida, we tried to prepare by walking the stairs in one of the tall buildings downtown for 1.5hrs every weekend (much tougher in boots than running shoes BTW). We also made sure to get some regular runs of 7-9 miles. This conditioning REALLY served us well on every single hike we did and I highly recommend doing the same when you plan to visit. They take the weather very seriously here and were checking throughout the day before and the morning of the hike. For the crossing, you are on a couple of volcanos (active – neat) that provide no protection from the elements for almost the entirety of the trek. The surrounding countryside is comparatively flat and certainly much lower than these two peaks. This allows NZ’s already fast-changing weather to blow in from any direction in an extremely short amount of time. When you roll all of this together you get a location that could be super pleasant for one group and intensely challenging and unsafe for another. Unfortunately for us, the outdoor guide who also drives the bus made the call that the weather was going to be too bad for anyone to make the trip. In fact, it was the first bad weather or even real rain that they had had for 2015 with two storm fronts moving through the area that day, temperature dropping to just above freezing, and the real concern, winds of about 90kph. We weren’t as familiar with metric wind speeds so it was put into perspective this way: 30kph is something that happens up there regularly, 60kph is difficult to walk in, and anything more and a person Melanie’s size probably couldn’t walk. Everything else I’m going to talk about in Tongariro National Park will make much more sense if I help you get your mental bearings first. The bulk of the park is open flat-ish scrub land. Picture the American Southwest but with much denser and colorful scrub and you are pretty close. There are some wooded areas sprinkled in as well. Rising out of this are two distinct volcanic peaks. Mt Ruapehu, the larger and more southwesterly of the two, looks more worn down than its brother, sporting a sort of messy flat top hairstyle. It has the only glacier on the North Island and is used a bunch for skiing. Important to LOTR fans, scenes where actors needed to be in blasted volcanic barren lands were filmed here. So this is home to Mordor, Emyn Muil (where Sam and Frodo wander before reaching Mordor), and Mt Doom. Also in this area, Gollum grabs a fish in a little creek and Isildur cuts a certain ring free from a hand. To the northeast Mt Ngauruhoe rises in a more iconic volcano shape. This mountain helped inspire the look of Mt Doom when seen from a distance (Mt Doom was a digital creation). Because the mountain is sacred to the local Maori people, location filming was not allowed near its peak. Glopped on to the northern side of Mt Ngauruhoe is Mt Tongariro which is a rambling collection of volcanic activity. 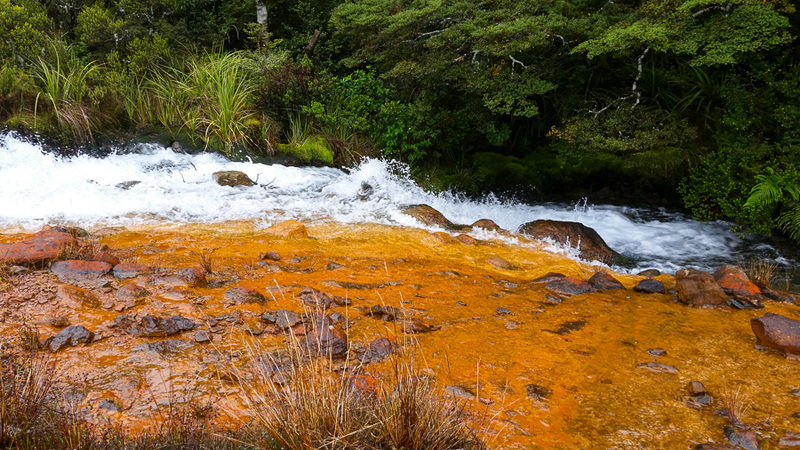 When hiking the Tongariro Crossing, this is where you spend your time. Since the Tongariro Crossing was completely out of the picture, we did three shorter hikes that day at nearby Whakapapa Village (pronounced fahk-a-papa). The first was Taranaki Falls, which was a lovely two hour hike roundtrip that took us on a lower portion of Mt. Doom (Mt Ruapehu). This hike is supposed to have magnificent views of Mt Ruapehu and Mt Ngauruhoe, but we were under thick cloud cover the entire time so I don’t know that first hand. When we arrived at the trailhead, parking was filled to capacity and we noticed more than a couple of people that had met to shuttle up to the Tongariro Crossing with us had the same idea as us and ended up here. Our motel hosts recommended doing the upper part of the trail first and returning on the lower track (counterclockwise) and this worked out well. Most of this trek was through alpine grassland with colorful little flowers and lots of little scrub poking up through the rocks. Near the start of our hike we did go through some beech forest which offered some nice variety and shelter to get out our raingear as the storms rolled in. The trail was well defined and many people were joining us that day but we were spread out enough that most of the time we enjoyed solitude under the blanket of quiet grey skies. The fall itself was a beautiful 65’ cascade that turned that got channeled into a lively little stream that we followed for a while. On the way back we saw a smaller fall wedged into a little crevice that was so picturesque we would have liked to pick up and bring to our back yard. Taranaki Falls is on a Loop Trail. This is Sign at the Preferred Trailhead where we Started. Not a Great Picture but I Really Like it Anyway. Next up was Silica Rapids which was just across the street and up the road. This hike was quite a surprise. We started out on a standard woodland hike beside a stream but as we ascended the mountain, the bed of the stream turned a bright mustard yellow. At some points we would emerge to cross a series of alpine bogs (a first for me and a beautiful environment) on boardwalks. Eventually the trees and bogs gave way to rocky ups and downs and eventually we chose a side trail to take us to Bruce Road which we walked down back to our car. It was a good 2 hour round trip hike and one that I enjoyed even more than I expected. On a clear day, the views of the other mountains would probably be very nice, but we never saw them since it was so foggy and rainy. Possibly the best way to do this hike would be with two vehicles. Drop one at Whakapapa Village and take the other to the other trailhead on Bruce Road where there is a small parking area. Start your hike from there and cut probably a half an hour of walking down a relatively narrow and somewhat dangerous road for pedestrians from your trip as well as walking mostly downhill the whole time instead of uphill as we did it. This trail can be strenuous as it does have some steeper areas to it. After that we hopped in the car and decided to drive up Bruce Road as far as we could get. Who wouldn’t want to get to the top of Mt Doom? As we steeply ascended the twisty little road we began to see flags and what looked like hay bales every so often. We couldn’t figure out what they were for until we go to the top of the road where there is a little roundabout and a collection of buildings and parking referred to as “Top o’ the Bruce” or Whakapapa Ski Field. People were donning their body armor and preparing for some sort of high speed race down the mountain. I’m not sure if they were going to be standing up on their giant skateboards or lying down on them, but either way it seemed extremely crazy to me. We saw some folks practicing the night before on a lower and less steep part of this same road. They were standing up then, but maybe that was to give themselves more of a challenge on that slower part of the mountain. By this time the bad weather was starting to roll in and we ended up just turning around at the end of the road (still pretty far from the summit) and coming back down. Right from the Start the Water Looks Unusual. Not the Brilliant Orange it will be Higher up the Trail Though. After Exiting the Forest, we Cross an Alpine bog. Extremely Beautiful and Peaceful. A Memory I will Cherish for a Long Time. After More Alpine Grassland and Forest, we Cross Another Bog. The Water is no Longer Orange. Getting more Orange Again. We are a few Minutes Away from the Bright Orange Photo at the top of this Article. After we Take the Fork to Bruce Road, There are a Series of ups and Downs. From the Small Hill where this Picture was Taken you can Just see Bruce Road for the First Time Near the Treeline. Driving to the top of Bruce Road we see these Barriers for a Skateboard Race. What it Looks Like Near the top of Bruce Road. A two Hour Hike from here will put you at the Summit of Mt Ruapehu. The second falls, Tawhai Falls, was our final stop in the area. It was a quick 5 minute walk to an observation area. Plenty of people were going here with kids. I felt sorry for those with strollers because there were some steep stairs to deal with. It was a nice little side trip and if you are in the area, why not? We ate the lunch we had packed for the canceled hike, a quick PB&J with some trail snack,s and then with our new-found time, we headed over to Lake Taupo. It was an area that others said was their favorite in all of NZ and one that we were sad we were previously going to miss. It is a more developed vacation area on a huge beautiful lake. We got to see an Ironman triathlon taking place and it answered the question of what all the people flying in with us had been doing that huge flat bike-sized luggage. We made the quick drive to Huka Falls and it was completely worth it. That bright mint blue water rushing through a small sluiceway was a spectacular sight. The color of the water was impossible. The amount of water was tremendous. The number of people at this small area was astonishing. While there we even got to see a jet boat come racing up the river, doing doughnuts, and stopping just short of the falls. This sad Photo does not do Lake Taupo Justice. It Really has a Hobbity Feel. I Think Because it is so much more Developed than other NZ Locations. An Ironman Triathlon Nearing its Completion. It was a very grey Overcast Day. I Cannot Imagine how Blue this Water must be When it Reflects a Blue Sky. Bridge the Previous Picture was Taken From. A Colossal Amount of Water getting Dumped Through this Little Channel. It Sounds and Feels Powerful even from this Distance. Look at how Close the Jet Boat Gets. Before we left Taupo, we made a point of finding the thermal spring mentioned in NZ Frenzy. I was so happy that we got to do this! Even though it was raining, it was full of people of all ages. What a cool free local attraction! Parents were playing with kids. Old people were soaking. Young people were flirting or relaxing with their thoughts and a beer. Without the Frenzy book we surely would not have known about or been able to find this place. Using the GPSr we drove to the end of a residential street where an old boarded up building from the I’m guessing the 1800’s was painted like a billboard to proclaim that it was near the restorative thermal spas. We were tired and ready to be back at the room that I didn’t take the time to photograph it, but I sure wish that I had now. Off the side of the road was a locked car gate and past that a short sandy unmarked walk lead to a steaming waterfall pumping scaldingly hot water out of the ground. There were fences all around it which was a good thing since I’m sure it would have blistered skin. Downstream people picked their spots where this water cascaded over rocks and mixed with the Waikato River giving each spot a custom temperature. We kicked off our shoes and stuck our feet in right at the lowest point and even there it was quite warm almost too hot for me. It really recharged our feet and we commented that they still felt energized an hour later when we were driving back to the hotel. I can see how people would have thought the water was magical. My feet really felt like they were pulsing with energy – a really weird and cool sensation. I wish we had more time to hang out there. If you make it to Lake Taupo, it is well worth your time finding this little place. Sidenote: I think there is a more straightforward way to get to these springs as I believe there is a paved car park right on the Waikato River with running trails that will lead right to this spot. Hot Springs Source. Flowing from the Bottom of the Picture Towards the Top. Surprisingly, the Steam doesn’t show in these Pictures. She was the Closest to the Source. Probably 100′ Downstream? I don’t know how she could Take It. Where the Spring Meets the River. The Water is Still Very Hot. You can see a Puff of Steam Near the Bridge on the Right.